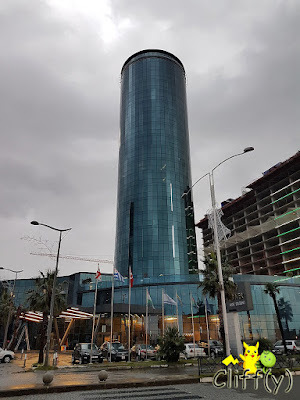 My BFF and I stayed at Sky Tower Hotel (5*) in the lovely city of Batumi, Georgia. 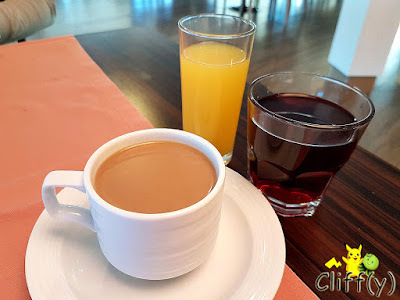 Even though we spent two nights there, we only had one chance to sample the buffet breakfast as we had to leave the hotel early in the morning on our last day in the former Soviet Union country. 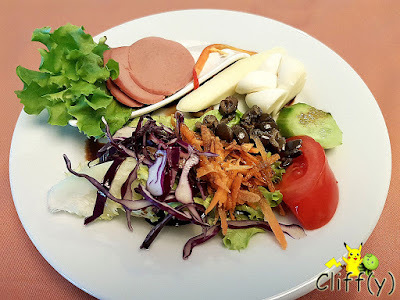 The vegetables for the salad were acceptably fresh, but they weren't that juicy. I drizzled some balsamic vinegar, which was piquant enough, over them. The sausage slices didn't have much flavour, while the cheese was spongy. How many egg-based items can you spot in the picture above? Most of them were so-so, but the vegetable ragout turned out to be quite good. I wonder if they purposely choose to rely so much on eggs for most of the cooked items for convenience or cost-cutting purposes. 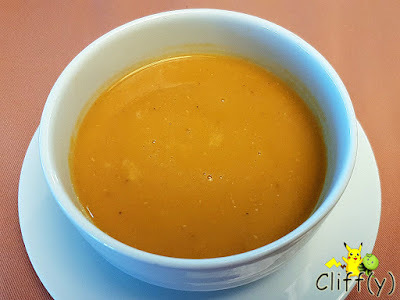 I'm actually not very sure, but I think that was pumpkin soup. It wasn't that thick with a very light taste, bordering on being insipid. I regretted taking it, but still finished it anyway. 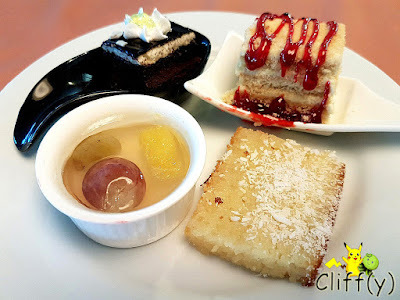 In general, the cakes were appetising, especially the one with strawberry jam as it was moist and not too sweet. The jelly with two grapes and a piece of orange didn't have any taste and the texture was too soft. I admit I accidentally added too much milk into my coffee, but the latter was pretty aromatic. Between the cherry juice and the orange cordial drink, I preferred the former. 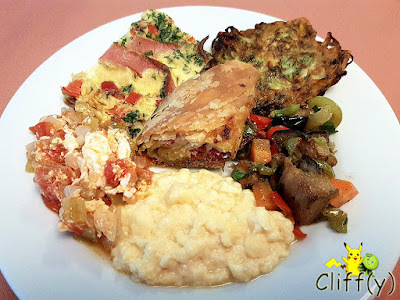 As you might've already guessed, I wasn't particularly impressed by the food items served that morning. Pika's advice: Since you can book a room without breakfast, I shall leave it to your discretion.